The follow-up to Clinical Governance - Making it Happen considers the implications of clinical governance for a wide range of health care professionals including nurses, medical directors and chief executives. The contributors examine the role of the new government organisation NICE, the responsibilities of those working for NHS organisations and the benefits of patient involvement. Advancing Clinical Governance will enable health professionals to implement clinical governance effectively and with confidence. This book is a most helpful review of current trends…Chapters are offered by a range of well recognised authors. All are well focused, concise, and will be of help to every clinician. At a price to gladden the financial director's heart, every clinical director (and their successors) should be bought one. Non-executive directors should already have bought their own. We all have to get a grip on quality control…A good start would be to read this book. It won't answer all your questions, and there will be some bits you (more or less) know already. But there is wisdom, and there is an astringent quality to some of the chapters. That on the "myth of accurate information" has real bite. Stacks of contacts and sources are also given. Read this and you won't be caught out in this brave new world. 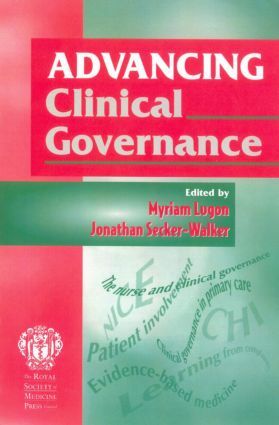 This is a good book: it is interesting, varied and useful…If you are interested in clinical governance as a student or an observer, or if you want to get your bearings, this is a good place to start. To demystify the rhetoric and understand how clinical governance applies to you and your service, read this book. This book offers a useful guide to many of the dimensions of clinical governance. There are a wealth of references in many of the chapters and a useful resource section at the end. Relevant to everyone involved in healthcare provision, the book offers readers a refreshingly practical and insightful perspective aimed at ensuring that quality remains at the heart of the NHS. Its strength lies in its ease of reading, its practical advice and its breadth.